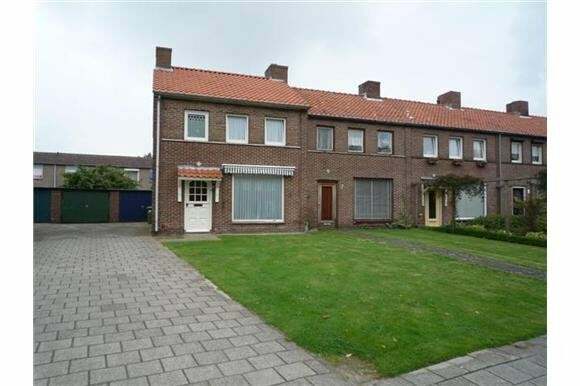 Corner house fitted with carpets and curtains on favourable location in popular district “Zeelst” near Venlo and near all desired facilities and highways A2 and A67. Hall with tiled floor. Cupboard under the stairs with meter cupboard (4 groups and 1 earth leakage circuit breaker. Partially tiled toilet with fountain. Extended living room (ca. 33m2) with roll-down shutter at the back. Kitchen with wooden kitchen unit, single sink, hob, cooker, oven, refrigerator and geyser. Scullery with washing machine connection and door to back garden. Southeast-facing, paved back garden (ca. 12 Mtr), with free rear access, brick shed with electricity. Bedroom 1 (ca. 2.70 m. x 2.70 m), situated at the back. Bedroom 2 (ca. 3.94 m. x 3.50 m), situated at the back. Bedroom 3 (ca. 3.15 m x 3.50 m), situated at the front. Completely tiled bathroom with washbasin with shelf and shower with thermostatically controlled tap. Loft ladder to spacious attic storeroom with CH-combination boiler.